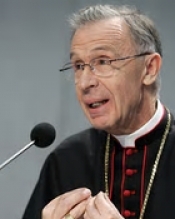 – He speaks fluent Latin (and German and English and French and Italian); he’s prepared to have theological disputes in the language of the Church. – He’s Bergoglio’s choice (see below). – He seems (from reading other writings of his that I was exposed to when I studied under him in Rome) to favour the empty-hell theory (or at least a theory approaching this). – He turned 73 two months ago and will have to submit his resignation when he is 75 – could be that he’s simply a placeholder. Our Italy correspondent is known throughout the English-speaking world as a champion of family and cultural issues. First introduced by our allies and friends at the incomparable LifeSiteNews.com, Miss While lives in Norcia, Italy.